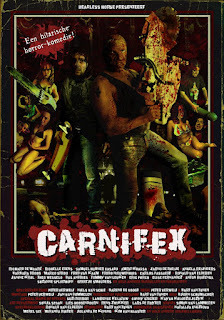 The plot of CARNIFEX is a simple one: Bram and his friends get wasted on drugs and alcohol and its not long before Bram's friends start turning up dead. Bram tells the police about the murders, which of course they don't believe him so Bram pursues the killer by himself. Described as a Dutch horror comedy by its makers, CARNIFEX seems to be more of a showcase film to show possible employers what they can do with a limited budget. The graphic sfx are great and show a love for the splatter films of yesteryear but the comedy is definitely lacking. Those who like lots of blood and little story in their films will be fulfilled, but the majority of people will watch once and move on to watch far better films.